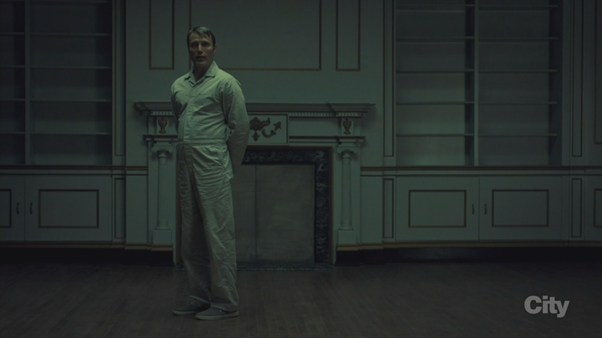 Just what was it that motivated the character of Hannibal Lecter throughout this series? Even after this series finale, it’s hard to think of a definitive answer though two answers rise above their peers. Perhaps he was just a force of nature, spreading misery and agony wherever he went; in this interpretation of the series, he has no purpose beyond just being what he is. It is a simple explanation, yes, but also an attractive one. It paints Hannibal as a thing more than a person and in doing so allows us to keep from considering any human elements of a creature like him – like a storm at sea, there is no reason for Hannibal; he just is. Yet, convenient as that explanation may be it is also insufficient in many aspects, primarily because it offers so little in explaining Hannibal’s interest and obsession with Will Graham. The dynamic between these characters goes well beyond predator and prey, especially since the roles each has alternated rather regularly throughout the series – these characters are more reminiscent of two planets circling the nexus of a black hole, destined to collide and annihilate each other. Add to this calamitous mix a dash of a fiery red dragon, which acts as a catalyst for the aforementioned collision, and you have the recipe for tense season finale. 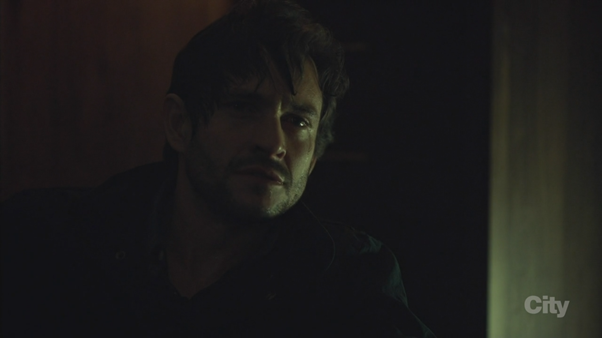 Hannibal’s connection to Will was established very early on – he took an interest first in the profiler’s incredibly ability to empathize and then in the inner darkness lurking within him. Hannibal’s goal was never to kill Will – excepting, perhaps, when he tried to slice his head open earlier in the season – but rather to corrupt him absolutely. Hannibal sees in Will a potential partner; a partner in insanity, certainly, but also a life partner but that partnership is predicated on Will’s ability to cut himself loose of morality and sanity and given in to Hannibal absolutely. Will, for reasons that seem to change over time, resists Hannibal’s influence first for moral reasons and then for vengeful ones. What we see in this finale however, is Will essentially giving in – he has fought Hannibal’s temptations long enough and if that means he must damn himself in the process, then so be it. It is a morbidly touching moment when the two estranged friends (to put it mildly) finally kill a man together – this has been something that they’ve been attempting to do together since the second season finale, when Jack was to be the victim instead of Dolarhyde. “This is all I ever wanted for you, Will. For both of us.” as Hannibal says. Yet, it’s all a dream, really; the reality is that this one moment of honest bliss is all either character will get. Their wounds are too severe and like a couple that recently parted ways, they know that while they can still enjoy each other’s company, they will never see eye to eye on anything else. Did Will kill Hannibal? Probably not – Hannibal stood too close to the edge for a man who intended to live but I do think that Will himself did not realize he was going to take Hannibal along with him until that very moment. So ends the tale of the star-crossed lovers and what a trail of gore they have left behind. No character has emerged from Hannibal’s influence undamaged – but I think it might be Jack Crawford who bears the greatest guilt. His actions have been questionable throughout the season but this finale took the cake. Letting Hannibal loose on purpose was never going to end well and as it stands, the way things turned out were far better than Jack had any right to expect. Of course, it seems that the writers wrote themselves into a little bit of a bind – they needed a reason for Hannibal and Dolarhyde to meet yet their characters are far too savvy to ever let Hannibal free once they had him under lock and key. The end result was far from convincing – Hannibal being freed on the recommendation of a man who is close to Hannibal’s minion as can be was never going to make a whole lot of sense. Jack will bear the most guilt for his actions in bringing Will back into the field and breaking yet another promise to keep Will safe but more than anything, he should be mourning a friend; a friend who put all his many, justified reservations aside and answered when Jack came knocking. Yet, Jack’s guilt is perhaps the lightest sentence of the main cast – Frederick Chilton, while more of a secondary character – will never recover from his scars and at this point, there is definitely a case to be made for just putting the poor man out of his misery. Dr Bedelia Du Maurier has also suffered a great deal at Hannibal’s hands – if the last few weeks had given us the impression that Bedelia had outsmarted Hannibal, the finale’s final moments should tell us otherwise: despite Hannibal and Will both being dead, Bedelia is still performing auto-cannibalism. Is that a result of Hannibal’s scars on her mind? Did she fear his return so much that she decided to get started before he could do it himself? Or maybe, just maybe, Hannibal did survive his fall and decided to make good on some of his promises – after all, he is known to always keep his promises. 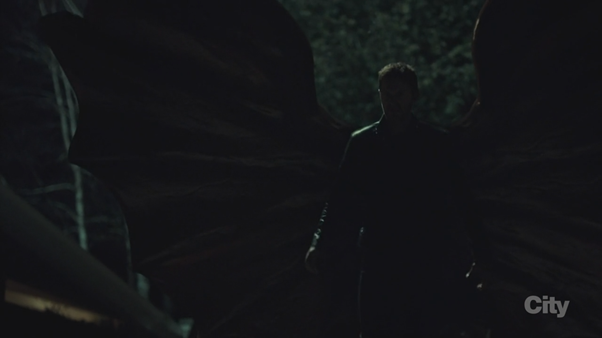 What about the character of Francis Dolarhyde? What role did the Great Red Dragon play in all this? Describing him as a catalyst is at least a little misleading – catalysts leaves their respective chemical reactions unchanged. That said, there is no denying Dolarhyde’s role in forcing both Will and Hannibal to iron out their issues once and for all. Had someone told me at the beginning of the season, that Francis Dolarhyde would be the final villain and feature in the final confrontation in the series, I would have been sorely disappointed. The moment that Will and Hannibal teamed up, Dolarhyde’s fate was pretty much assured – yet, the final fight was surprisingly close and given the show’s unpredictability, no outcome would have truly, unacceptably upsetting. Perhaps then, I am looking at Dolarhyde’s role all wrong – it wasn’t that he was ever supposed to take out either Will or Hannibal but rather that he posed a great enough threat that only he could ever force them to reconcile and put aside their horrific differences. With that, we bid farewell to one of the most unusual television series in a while – a series that featured gratuitous gore yet at the same time combined it with immaculate dialogue and presentation. There were times when the entire set up became altogether too ponderous but the first few seasons had a good mix of real world sensibilities with Hannibal’s more abstract discussions. If the show is not destined for a fourth season it wouldn’t be the worst thing – it ended on a strong, reasonably positive note and as far as I’m concerned this is the ending that it deserved.